The Cloistered Heart: Sort of Saints ? I used to sew, or at least to make attempts at it. Some of my projects didn't turn out too badly... until you looked at them closely. The thing was: I had no patience. So I cut corners. Darts in dresses were "sort of" marked, patterns were "sort of" followed, the edges of pillows were "sort of" measured. Things often looked okay at first glance, but I produced more than a few examples of poor craftsmanship. Uneven hemlines, puckered zippers, a dress that was discovered (while I was wearing it at Mass) to have a panel of printed scenes sewn in upside down. There were even a few seams that suddenly split open. Not so bad on a pillow; problematic when they're holding together one's skirt. I am not a talented seamstress, but neither am I a total loss at such endeavors. When I've made the effort and followed patterns, I have actually produced serviceable items. If I lived in a physical monastery and was assigned the task of habit-making, I would be a challenge. There, however, I'd have to learn to follow the instructions... no corner cutting, no choosing my own way of doing things. After all, we wouldn't want Sister Mary Jane's wimple falling off in the middle of Mass. 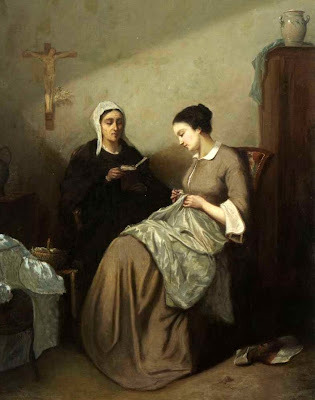 We have talked here about the "habits" of a cloistered heart. Habits of holiness, acquired over time with repetition, habits of prayer and choices for God's will. As persons called to sainthood (and yes, we definitely are), we are each given as much talent (grace) as we need to become truly holy. But we cannot do this without following God's patterns, the templates He has clearly marked out for us in Scripture and the teachings of the Church. Our Lord has not left us "patternless." He gives us clear guidelines, ones that will wrap us in virtue and prepare us for sainthood. But we cannot get there by being "sort of" prayerful, "sort of" humble, "sort of" saints.